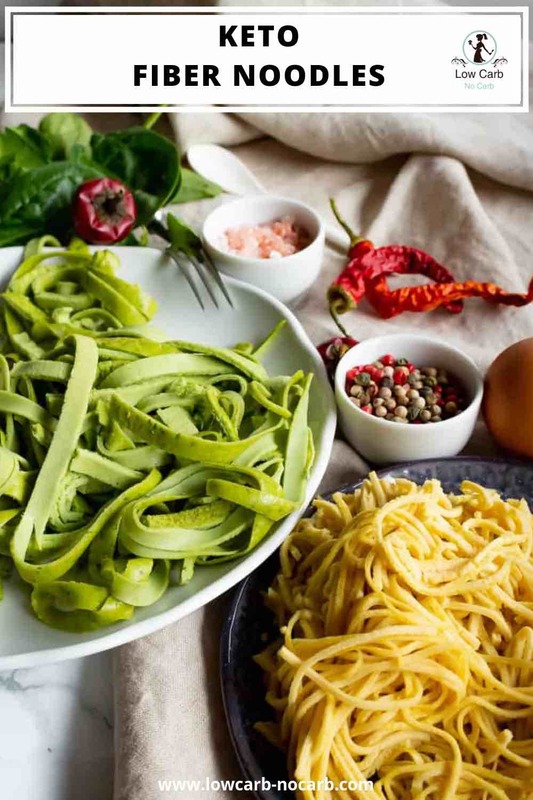 Those delicious Keto Fiber Noodles are easy to make and can be used as an addition to soups, pasta dishes, lasagna and whatever you desire. They are a much healthier option to normal noodles we have been used to in our previous lifestyle. 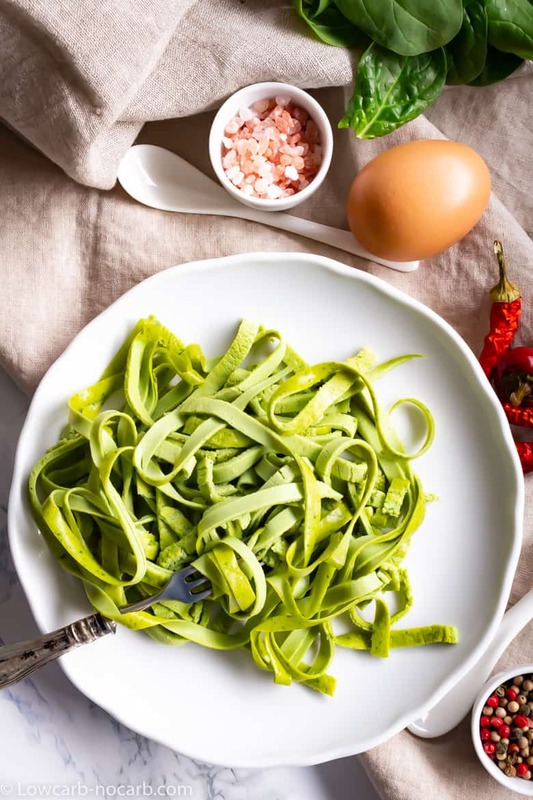 What types of Keto Noodles exists? 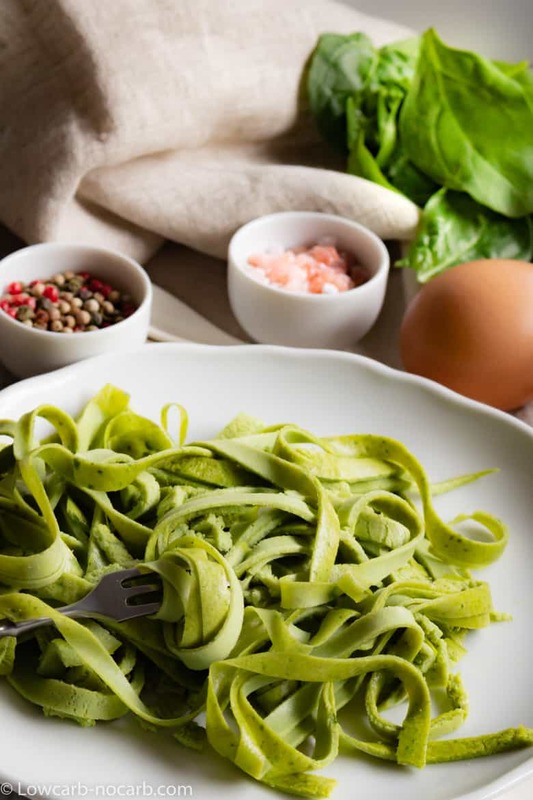 As you might have probably already tried and researched, there are really great options to make and use Keto Noodles. They could be done from different varieties of ingredients and flavors. Shirataki Noodles, which are normally bought and not easy to make at home, but a great alternative. They are made from the fiber of the Konjak Roots and are normally sold in water containers. We use it pretty regularly and love it. They are easy to make and can be added to whatever dish you make. The advantage is, that once added into a dish, they will quickly soak up all of the flavors. You can try with our Shirataki Chicken Noodles Recipe as an example. Kelp noodles, which are made from Seaweed and are sold mostly in a dry form. Egg noodles made with a mixture of eggs and one of the Keto Flours. Fat Head Noodles made from the famous fat heat dough containing mostly mozzarella cheese, eggs, and Keto flour. Keto Fiber noodles, which I am going to write about this whole article. What kind of Keto Noodles to choose? The idea with Keto Noodles came in 2 occasions. First was, when I started making our famous Keto Fiber Bread and have realized that Potato or Oat Fiber is a perfect replacement for our Keto or Low Carb lifestyle. I have seen that those fibers can be used on more occasions, then only baking a keto bread with it. Second push came when we visited our friends and I have seen their Italian Pasta Machine. At that moment, I knew, I have to try it and make something we will all be happy with. They were kind enough to lend me the gadget for a few days to make my experiments. You can just imagine, how my family was excited when on the 7th day in a raw, they got pasta. 🙁 But that is the way, family of a food bloggers lives. My first attempt was the Fat Head Dough. Made it, rolled it and tried it. But the problem with Fathead dough was, I would suspect the cheese. The way this machine works is, that while you are rolling it through, the dough gets pressed into a thinner and thinner piece and then subsequently gets cut into your desired pasta type. I was unfortunately not being able to get it into really thin slices except one time. And therefore I have decided not to go with this potion. I have actually also tried to cook the Fathead pasta I was able to get from the machine, but it was not as tasty as I would have expected. I have to add, that I was somehow pretty disappointed because, for some reason, this was the dought, which came to my mind immediately after seeing the Pasta Maschine. Psyllium Husk. I have seen lots of noodle recipes using Psyllium Husk and thought no further than trying those. Made a few flavors, different types. Let my daughter try them, but she did not really like any of them. Neither was I excited, so I have decided to continue my experiments further. As most of the recipes on the blog are the once my daughter really likes, I had to work on it much more. I would rather have one recipe properly tried and tested, like 5 which are not really Top notch. And as my daughter is really picky, she is a perfect target for all of the trials. So without further adieu, I have gone to continue with making my own experiments completely from scratch. Let me tell you, I have made 8 different types of dough to compare and was ready to pick one. The best one. Had it tried by 4 friends and guess what the outcome was? Everyone liked something different. But after a real discussion on what I might change a bit, where I might add something a bit, we came into the conclusion and picked 2 winners. One of that winner was Keto Fiber Noodles. The second winner is coming soon and I would let you get surprised. If you really want to know, register with our Newsletter so you do not miss a single Recipe. On those days, I kept combining different ingredients and tried to pick the most tasteful one, the one, which would come onto the blog and which is loved by all. 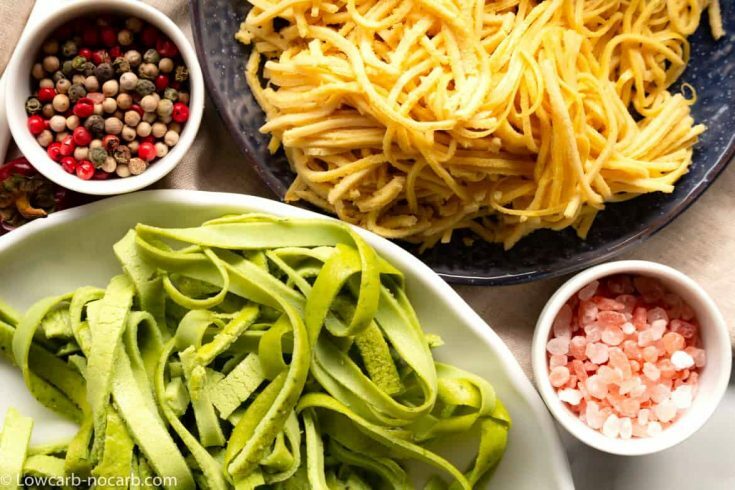 Towards the end, it was not anymore easy, because you have tasted so many pasta variations, that you could not remember anymore which one is which and how it tasted. I even made a tiny excel sheet with all of the noodles and their variations, which I then stuck next to the actual noodles and made some pictures, so I do not forget which is which. They, unfortunately, look really similar, but the taste is different. And I knew for sure, after a few weeks I would have no idea which one is which. On this day, I had the winners and I was just experimenting with the best looks. This was the most enjoyable day I have to say. 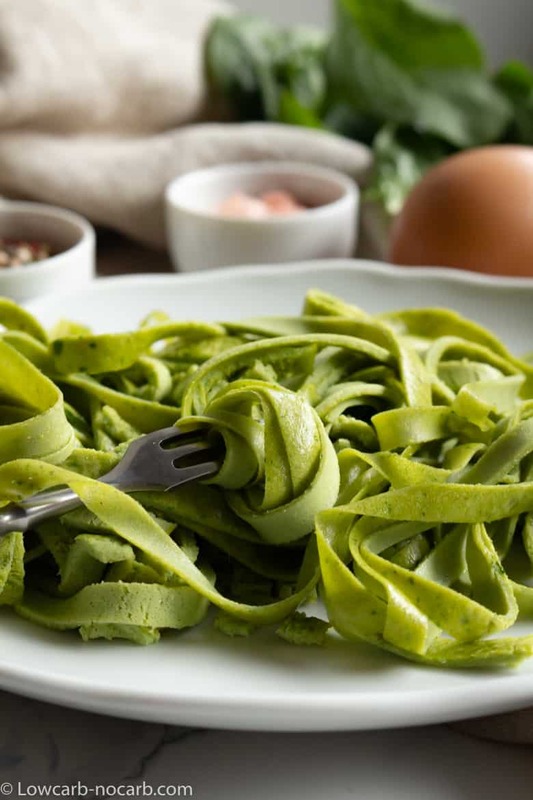 What are Keto Fiber noodles? Keto Fiber Noodles are noodles made with already so popular Potato Fiber or Oat Fiber. I have made this particular recipe with both of the fibers and the result is almost identical, so it really depends, which Fiber you are able to purchase. I do know that in the US, it is almost impossible to purchase a Potato Fiber and therefore Oat Fiber is a great replacement. If you would like to learn a bit more about both of the Potato Fiber as well as Oat Fiber, I have written about them fully in our Keto Fiber Bread Rolls Recipe. Both of those fibers are pure fibers, does not contain carbohydrates and does not raise blood sugar levels. As my daughter has T1 Diabetes and carries a continuous blood sugar monitor, all of the recipes are tried and tested with her directly. We see immediately if some ingredient is raising blood sugar, even though it is promoted as low Carb or Sugar-Free. Those ingredients go immediately out of our house. This is a proof, that whatever recipe you take from our website is a recipe really tested on a diabetic person and therefore it is foolproof. 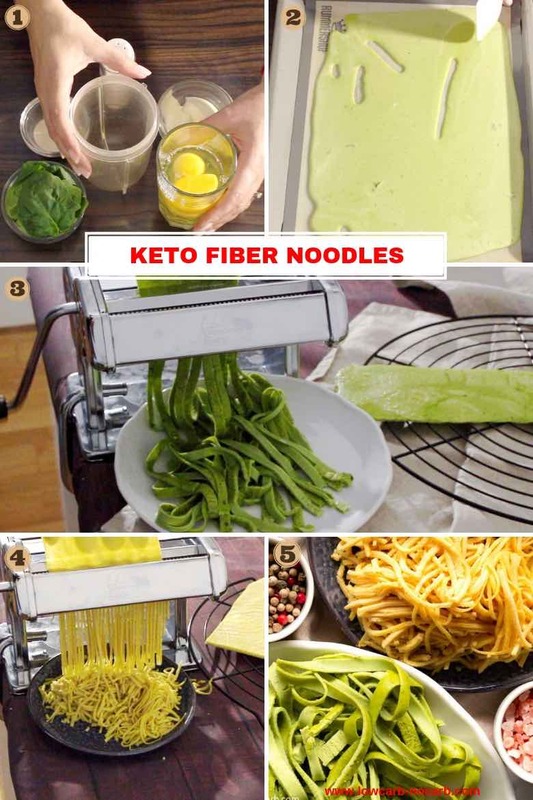 How to make Keto Fiber Noodles? While this recipe is made with Pasta machine, you do not have to be worried if you do not own one. I would suggest to first try without it, and if you are happy with the noodles and are ready to purchase, buy the machine only afterward. 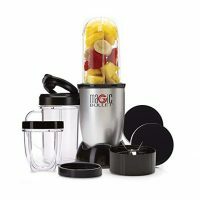 In the end, it is another gadget, which needs to fit into your kitchen. 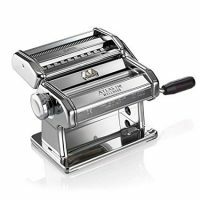 But by all means, if you do love making pasta and enjoy different varieties, this is really one of the great gadgets to have. 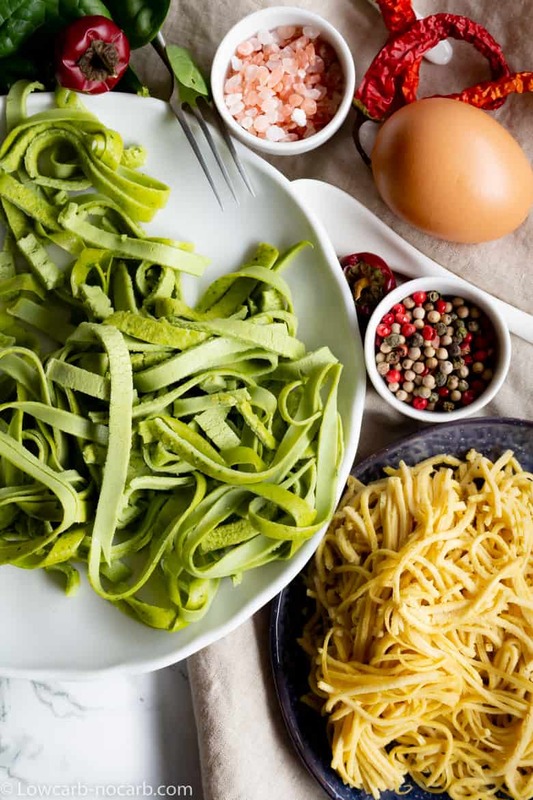 You can experiment with it and make really unbelievable different variations of pasta dishes. I would say, the really thin noodles as you see on the picture are only achievable with the Pasta Machine. I can not imagine you will be able to manually cut them into this lovely thin shape. Gently roll the whole dough. With a sharp knife, slice it into the desired thickness. In that way, you can make Tagliatelle, Linguine, Pappardelle, Fettuccini, Pizocherri. Once the dough is baked, just use a pizza cutter (the one with wavy shape rolls), if you want to make something like Reginette or Lasagne. Simply cut the slices into your desired sizes. How do you store Keto Fiber Noodles? I really like to use them fresh and once I make them, I try to use them on the same day. To make it is really easy and fresher they are, better they taste. But if you really want to store it, you can keep it in the container and leave it in the fridge up to 4 days. They are already cooked and therefore would just need to be reheated for the use. Can you freeze Keto Fiber Noodles? Yes, you can as almost anything. If you want to freeze them, I would suggest cutting the baked dough into 4 bigger sheets. Place a parchment paper in between each of the sheet and keep it into the freezer that way. You will later be able to take as many sheets as you need, without them each freezing into one other. And now I guess is the time to come directly to the full recipe. And if you would like to receive all of the new and upcoming recipes, do not forget to sign in to our Newsletter. Zuzana: What size pan did you use? I have a pasta machine and want to roll this. My first attempt, the baked fiber pasta was too thin and crumbled when I tried to roll it (knew I should have used 3 eggs). I was using a fairly large baking pan. I have used a standard size baking sheet, which fits into European ovens. Make sure, the bottom of the pan is as straight as possible. I have two baking pans and only one is fully straight. I always make sure, the liquid is spread as thin as possible for the pasta to be really soft and more like a real one. Hello, this may be just what Ive been looking for! After the noodles have been baked and cut, how do you prepare them for the meal? Do they need boiling or steaming to plate? 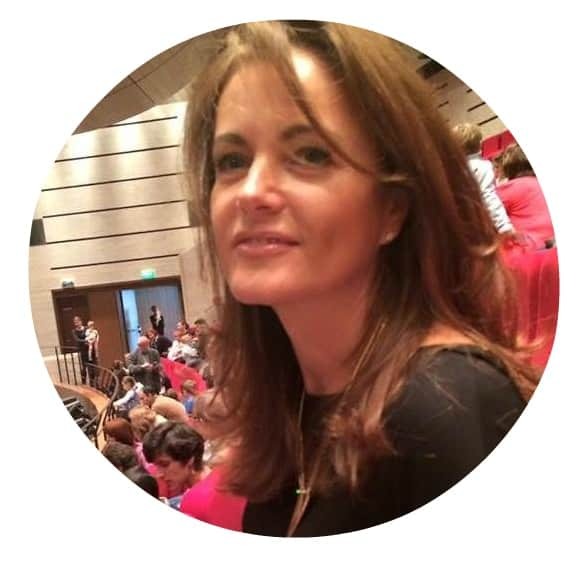 I just found your blog and am enjoying the style of your recipes. Hi and I am happy you found us. I just warm up the noodles. they are already baked, so except of making them warm, you do not need anything else.